Cleveland Browns quarterback Jason Campbell (17) on a keeper 1st down 1st half at MetLife Stadium. 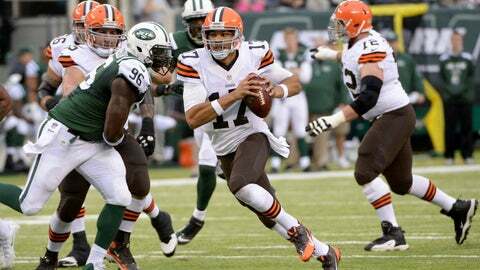 EAST RUTHERFORD, N.J. (AP) — A six-game skid is taking a toll on Jason Campbell and the Cleveland Browns. 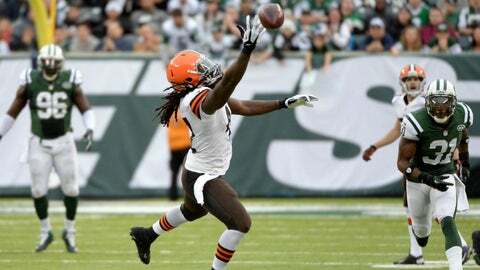 Campbell was intercepted twice and the Browns lost to the New York Jets 24-13 on Sunday. "Things just started to unravel today, the whole thing that’s been happening over the last month," Campbell said. "Being so close and not finishing it, I think is kind of pressing on guys. We just want to win so bad. It starts with me and everyone. "We just have to take a deep breath and just play and not stress ourselves out." Cleveland’s offense was hurt with star tight end Jordan Cameron out with a concussion. He might have been the difference, especially in the red zone. "I’m not happy with that game," Browns coach Rob Chudzinski said. "It’s unacceptable. It was a tough game to swallow." The Browns (4-11) led 10-0 late in the first half, but it could have been more. Campbell threw three straight incompletions — the last two to Josh Gordon — from the Jets 1 early in the second quarter to turn the ball over on downs. The Jets (7-8) scored twice in 78 seconds to tie the game. Former Brown David Nelson capped a 13-play drive by catching a 6-yard pass in the back of the end zone for his first touchdown with New York. After the Browns went three-and-out, the Jets got the ball back with 34 seconds left. Bilal Powell ripped off a 39-yard run to put New York in Browns territory, followed by an 8-yard scramble by Geno Smith. Smith then took off again for an 11-yard gain and was shoved by Tashaun Gipson out of bounds — and the quarterback appeared to embellish it, dropping to the ground. The late hit angered the Jets’ sideline, including a fired-up Jets coach Rex, and a few players on both sides shoved each other a bit. It ended up being an unnecessary roughness penalty on Gipson that put the ball at the 14. After Kellen Winslow’s 11-yard catch, Nick Folk kicked a 21-yarder as time expired. Smith remained cool and calm the rest of the way as the Browns came apart. "I’m sure anybody coming in here playing against him expects to get turnovers," Gipson said. "No turnovers for him, so I guess he put his foot in my mouth." Edwin Baker had a touchdown run for the Browns, and Gordon was somewhat held in check by rookie Dee Milliner, catching six passes for 97 yards. If this was Ryan’s home finale as the Jets’ coach, his players made it a good one. With Ryan’s job status uncertain, the Jets showed no signs of a team playing out the string. The players and coaches took a victory lap and high-fived fans after the game. "What I do know, guys, is that I’m coaching this team and my job is to focus on the present, what’s right now," Ryan said, adding that he doesn’t know if he’ll be back next season. Ryan isn’t the only one on the coaching hot seat. With each loss, Chudzinski’s job security diminishes. "I bear all the responsibility," Chudzinski said. "I’m the head coach of this team. Ultimately, this is on me. I’m committed to get it right." Smith had his first game with at least two TD passes since October, going 20 of 36 for 214 yards. He also ran for 48 yards. With the game tied at 10, Nelson — cut by Cleveland after training camp — got his second touchdown catch of the game on the second play of the fourth quarter, a 5-yarder. Two plays after Baker’s 2-yard touchdown run was nullified by a false start penalty on Gary Barnidge, Billy Cundiff kicked a 21-yard field goal to make it 17-13. But New York took control with a drive of over 6 minutes capped by Smith zipping up the middle for a 17-yard touchdown to make it 24-13 with 3:19 left. The Jets converted four third-down plays on the drive, including Smith’s TD. Ed Reed intercepted Campbell in the closing moments to seal it for the Jets.